Working in the Neon Sign Boneyard in Las Vegas is a true joy. This private location requires a permit and fee, so advance reservations are a must. But once you get there, you realize that any fee you paid was absolutely worth it. The Neon Boneyard boasts all sorts of old signs from various Las Vegas hotel properties. 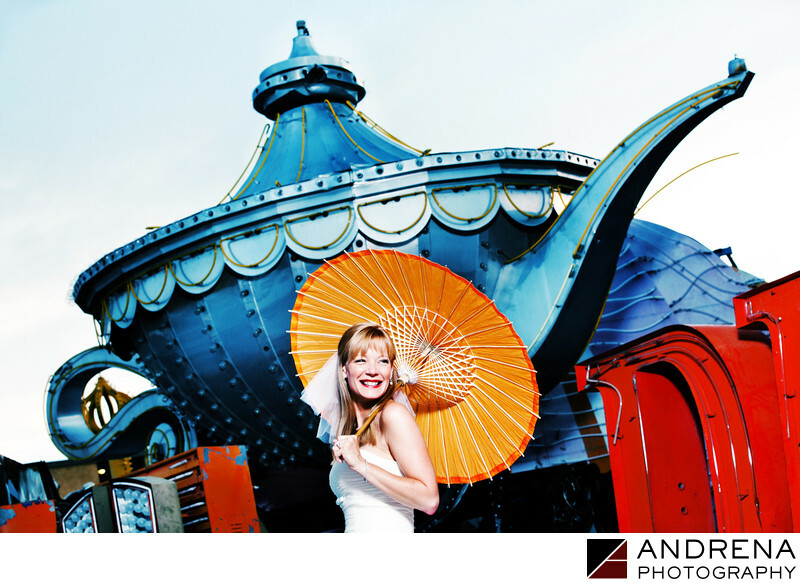 The huge metal lantern behind my bride is actually gray, but I changed the color using my own custom Photoshop actions. I brought an orange parasol to add color, and the combination of red, orange and blue created a beautiful and eye-catching backdrop for my bride. I actually photographed this wedding with just four days' notice. The groom was the founder of the Digital Wedding Forum, a professional photography forum that I was a longtime member and co-moderator for. The original photographer had an emergency situation that could not be avoided, so I got a call and randomly happened to be available on that weekend. The couple had a Jewish wedding at the Wynn Hotel, while my second photographer and I stayed at the adjacent Encore (the sister hotel to the Wynn, which is connected by a tunnel). It was a pleasure to shoot this wedding for someone I'd known for so many years, and for his darling bride, whom I now consider a friend. Jewish wedding photographed at the Wynn, Hotel, Las Vegas.